A sign explaining how the bridge allows access to Burtonwood. This is a list of services which allow members of the public to enter and leave from the same side; in other words, if you enter a service area having left London, you can leave it and head back towards London. Most services don't allow this. 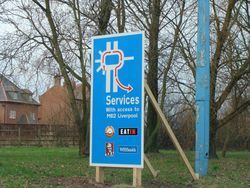 A drivable bridge is normally found at services built next to a junction, for the convenience of the operator. An unintended benefit is that people can use them to hold family or business meetings, as it is so easy to head back the way you came. As motorways rarely have roundabouts in the middle of them, we have titled this list "drivable bridge", but this doesn't mean a bridge must be involved: just that it is easy to turn around. Pages in category "Drivable bridge"